In 1994 Senator Claiborne Pell made the following observation: "Diplomas are crime stoppers. It costs much less to educate a prisoner than it does to keep one behind bars." Scholarship and research have continually shown Senator Pell to be correct, and yet it is not a stretch to call educational offerings in American prisons abysmal. Why is this the case? 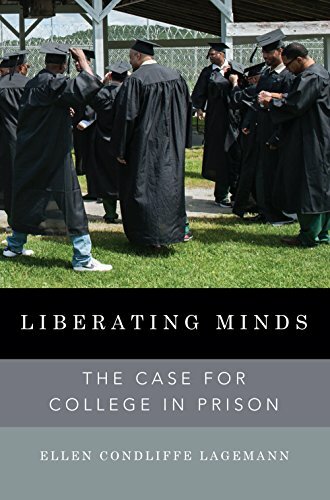 Ellen Condliffe Lagemann, the Levy Institute Research Professor at Bard College and Distinguished Fellow in the Bard Prison Initiative, makes a strong argument in favor of greater use of post-secondary education in the prison setting in her new book, Liberating Minds: The Case for College in Prison. The case is indeed compelling, and Lagemann's voice on the issue is authoritative and authentic. In addition to her long experience with the Bard Prison Initiative, she was the dean of the Harvard Graduate School of Education. The Bard Prison Initiative was founded in 1999, and currently enrolls 300 full-time students in a highly selective, degree granting college program inside six New York State prisons. The classes are high-level, and the work is hard. For the students, though, the experience is immensely worthwhile. Consider the statistics. Recidivism rates across the nation hover in the 50 percent range, confirming Lagemann's observation that today's prisons are "schools for crime." But graduates of the Bard Prison Initiative have a two percent recidivism rate. And even participating, non-graduating prisoners have only a five percent recidivism rate. Less recidivism equates to significant cost savings. A 10 percent reduction in recidivism rates leads to a savings of $635 million per year, according to the Pew Charitable Trust. And desisting saves untold money that would have been spent on police and the judiciary. A college education for prisoners benefits the economy in other ways, as well. A RAND Corporation study found that every dollar spent on education of prisoners returned five. Moreover, a college education greatly increases the chances of an ex-prisoner obtaining a job and at a livable wage. As Lagemann succinctly puts it, "Prison diminishes human capital. Investments in education increase it." Lagemann highlights other benefits to providing a quality college education to incarcerated Americans. Prisons are warehouses of human beings where boredom, monotony, and despondency are killers. College classes instill a sense of purpose in a purposeless place, ambition in a place where humans are perceived as devoid of value. Moreover, college programs can tamp down violence among prisoners, and between prisoners and staff. The data is clear: Prisoners who attend college develop positive peer relationships, act as examples for other prisoners, and provide fewer management headaches. Further, what is gained by a college education while in prison spills over into the community. A college-educated prisoner will better manage the reentry process. She will also act as a positive role model for community members and family upon her return to society. Better, more successful relationships will be forged. And college educated prisoners can provide valuable insight into social and criminal issues, given their status as community members, former prisoners, and college graduates. Lagemann's case for college in prison is convincing. The numbers aren't new, and we have long known the value of providing an education to the incarcerated. Yet there are challenges to the widespread adoption of college programs in prison. Going all the way back to a decades old, misreported, and essentially debunked scholarly conclusion that "nothing works," policymakers and prison authorities resist instituting educational systems that we now know do work. Getting past the tough on crime mentality is a challenge in America. But as Lagemann establishes again and again, college programs for prisoners are hugely beneficial in the long run. Politicians sometimes have a visceral reaction to the idea of educating prisoners, those who have breached the social contract. The reality is clear, however. College for prisoners saves money and provides great net benefits to the prisoner and the community.